This recipe is pretty dirty. At the risk of stating the obvious, it has nothing to do with the low-calorie, guilt-free popcorn snacks favoured by reed-slim gym bunnies across the City. Oh no. This is about making food sufficiently sinful for those moments when you want to shut the rain out, curl up on the sofa with similarly greedy friends, and collectively rejoice in the invention of elasticated waistbands. With ice cream, perhaps. Or popcorn. Perfect for a bonfire night party, informal Christmas drinks, or just a Friday night in, anyone who tastes this popcorn will love you forever*. *Assuming you’re not really weird and/or smelly. In a wide-based pan (that has a lid) on a medium heat, cook the bacon until crispy and cooked through. Leaving the bacon fat in the pan, transfer the rashers to some kitchen paper to mop up the excess fat. Blitz the bacon with the salt and pepper until granular. This is your bacon salt! Heat the bacon fat on a medium high heat and drop a couple of corn kernels in. Once these pop (it means the oil is the right temperature), add the rest of the kernels and pop the lid on. 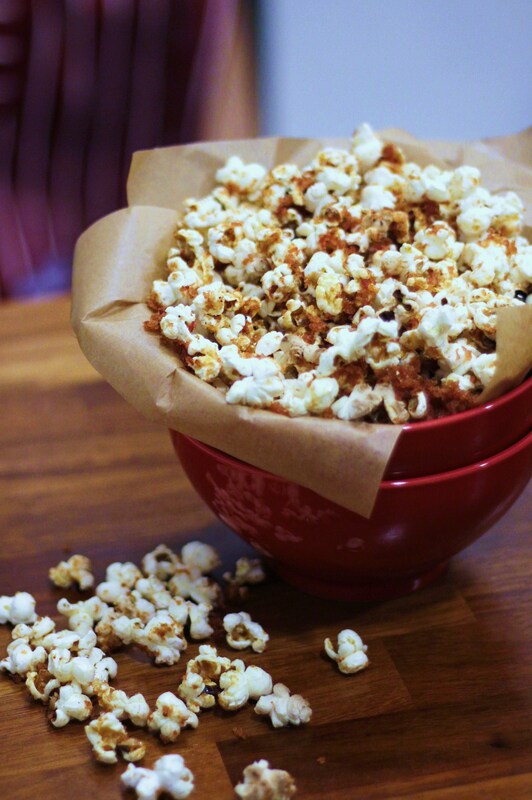 Tip: If your lid doesn’t have a steam-vent, leave the lid ajar to let the steam out – this will ensure crunchy popcorn. 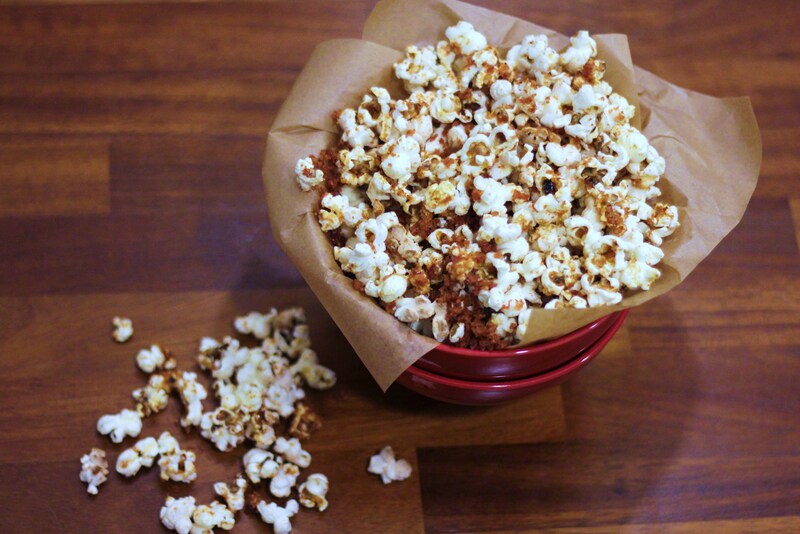 Allow the kernels to pop away, shaking regularly to avoid burning. When the popping has almost stopped, remove from the heat. Stir in the maple syrup and toss in the bacon salt. Serve immediately. Sources: Recipe and photos by pip & little blue. 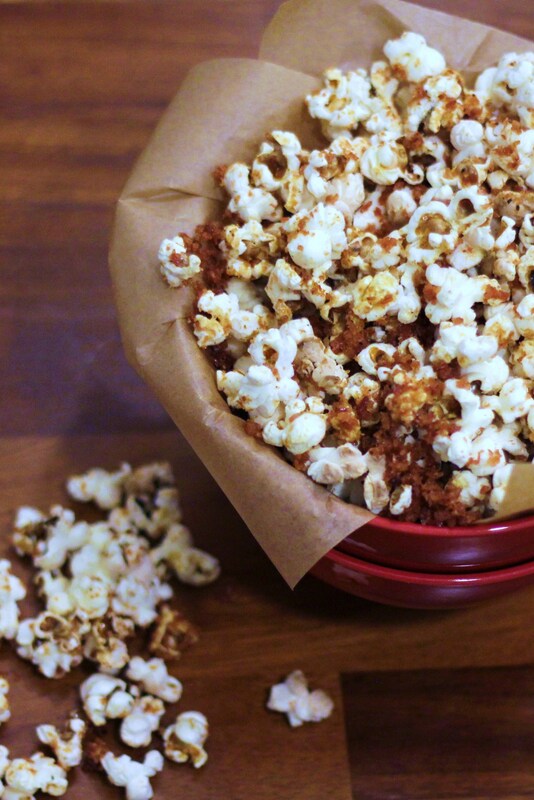 Tags: bacon salt, dairy free, gluten-free, maple syrup, party food, popcorn, stovetop popcorn. Bookmark the permalink.